The Brazed Plate heat exchanger is designed and manufactured with the point of consideration being the elimination of gaskets and frames. This is facilitated by the stainless steel plates that are brazed together. The brazing material is actually provided to apply the sealing between the stainless plates package and their contact point, that is a great support in holding the plates together, is also capable of taking a high pressure. The device ensures to provide premium efficiency levels and a superior pressure resistance by being designed in a way that requires each contact point to be brazed. 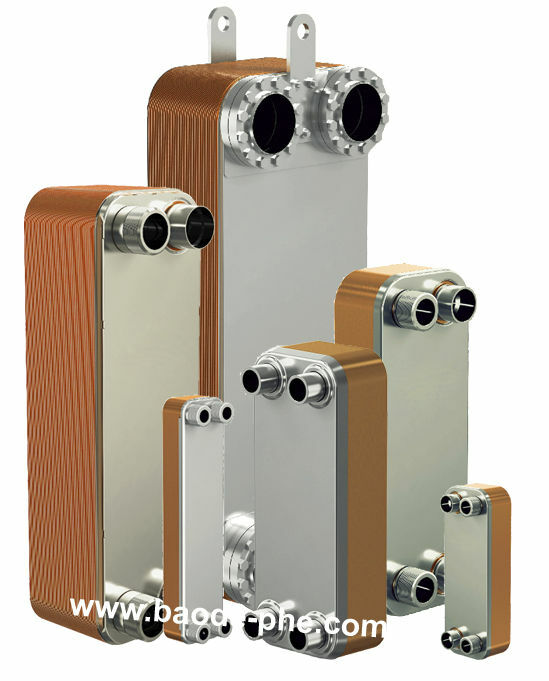 An advancement of the Baode's brazed heat exchangers is available that light and compact in structure and is capable of withstanding pressure up to 4.5Mpa. The main components of Baode's standard Brazed Plate heat exchanger include stainless corrugated plates and copper sheet, the stainless steel plates being brazed together by brazing material, that may be Copper or Nickel,in a Vacuum furnace but these can also be custom designed in accordance with the customer-specific requirements ensuring a cost-efficient solution for customers' heat transfer duties.